What better way to celebrate Preservation Month than to gather in the front courtyard of the Lilly Weston house, one of the two structures in Westlake on the National Register of Historic Places? That is what 30 citizens of Westlake did on the evening of May 31. 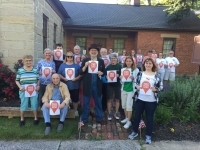 The National Trust for Historic Preservation has designated May as Preservation Month for many years and uses it to showcase their “This Place Matters” campaign. The Lilly Weston committee of the Westlake Historical Society thought it would be a good chance to express our affection for the historic house. The committee has been re-activated and meeting monthly since January 2016 with the goal of making the Lilly Weston house an integral part of the Westlake community. The house and its one-acre site were donated to the city in 2000 by Weston descendant Alice Ladanyi and her husband. As part of the agreement the city set aside $50,000 to stabilize the structure and remove later additions. Until about 2010, $41,000 of those funds, as well as about $22,000 of Westlake Historical Society funds were used to remove a rear addition, remove modern interior improvements, re-roof the structure, strip exterior paint from the stone and brick, replace exterior wood trim and repair windows. This work was over-seen by then-committee chair Steve McQuillin, a preservation professional and former Westlake resident. Two dedicated volunteers, Dr. Jim Anderson and Tom Schuerger, spent countless hours repairing windows, keeping the property tidy and raising funds to further the renovation efforts. 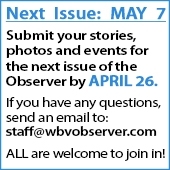 It was shortly after 2000 that the Westlake Historical Society entered into an agreement with the city to lease the structure for $1 per year and raise funds to renovate it and operate it as a museum of early Dover history. The efforts languished since about 2010 with the aging and shrinking of the historical society membership base and the scale of the task. However, Lysa Stanton, the Westlake Historical Society president kept the candles burning in the windows and the dream of a museum for children alive with the mantra, “Warm, safe and dry … warm, safe and dry.” She asked the author to pick up the reins as the new chair of the Lilly Weston committee in 2015. The building has been dry since the roof was replaced in about 2000. The next task for the committee was to make sure the building is safe to open to the public. The city and the historical society split the cost of a $7,000 structural analysis by a consulting engineer. The city’s portion was paid for out of that initial $50,000 allocation. What they found is that the 1844 stone portion of the structure is basically sound while the 1856 brick portion needs approximately $29,000 of improvements to make it safe for public use. We have begun fundraising efforts. Another effort in conjunction with the Westlake service department is to create a Heritage Loop Trail off of the existing all-purpose trail which encircles the Westlake Recreation Center Park. This Heritage Loop trail is planned to utilize a surplus pedestrian bridge and the abandoned emergency access drive that runs along the west side of the house to create a low-cost extension of the existing walking/biking trail system (the all-purpose trail links to the existing Hilliard Boulevard bike lanes). With the new Westlake elementary school soon to begin construction practically across the street, the idea of a museum for children in walking distance from their school, linked to the existing Recreation Center trails is an exciting possibility. To donate funds for this project and for more information go to our web site at www.lillyweston.com, our Facebook page “Lilly Weston House Committee” or contact us at lillywestonhouse@gmail.com. William R. Krause, AICP I am the Assistant Planning Director for the City of Westlake. I have worked for Westlake for 28 years. I served on the Bay Village Planning Commission for 5 years. I was a member of the Reuben Osborn Learning Center Steering Committee. I am a Board Member and Historian for the Westlake Historical Society and a Trustee of the Western Reserve Architectural Historians. I have been married to Debra for 36 years and am the father of three grown children, grandfather of two and owner of two Shih Tzu's.